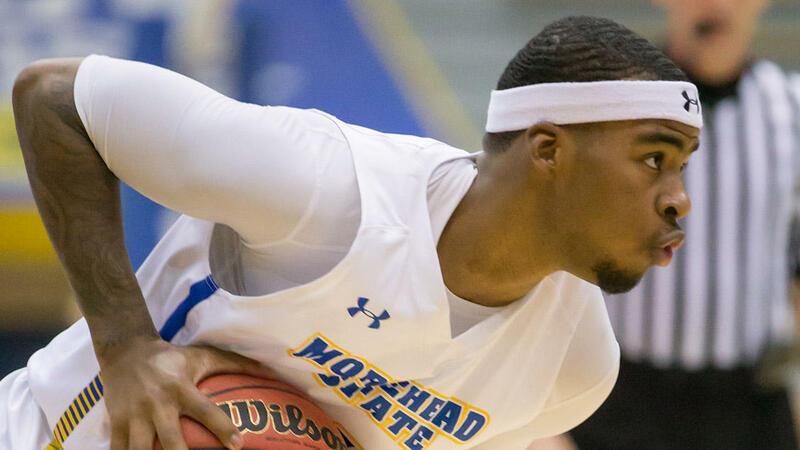 Down one more than a baker's dozen with 11:26 to play, the Morehead State men's basketball Eagles played an inspired brand of basketball in the closing stretch of their conference home opener, en route to a 73-69 victory over Southeast Missouri Thursday night at Johnson Arena. Both teams move to 6-12 overall on the year. MSU improved to 2-3 in Ohio Valley Conference play, while the SEMO Redhawks fell back to 1-4 on the league slate. "We've told the guys since the IUPUI game that no matter what adversity is thrown your way, you step up and shake it off," said head men's basketball coach Preston Spradlin. "You can allow misfortunes to bury you, or you can use it to prepare you for the battles to come. For us to see the score balloon the way it did, and culminate our efforts with a win, it's a credit to our guys for buying in and believing in themselves." Down 52-38 at the midway point of the second half, the Eagles outscored the visiting Redhawks 23-6 over the succeeding seven minutes to turn the tide back in their favor. Freshman Ja'Cori Wilson once again found himself starting a significant run, finding the cup going back door on a feed from senior Lamontray Harris. During this stretch, MSU nailed 5-for-9 from behind the arc, including three consecutive makes from long range from the Louisville product Harris. Senior A.J. Hicks dished out a career-high 11 assists, while also coming up just one point shy of a double-double, finishing with nine markers. Tonight's efforts broke Hicks' previous mark that he set this year, tabbing nine assists twice already this season (vs. IUPUI, at UConn). The Eagles finished the evening with 19 of their 24 field goals coming with assists. Harris paced Morehead State in scoring with 19 points on 7-for-11 (.636) shooting, six rebounds, and three blocked shots. Joining the Eagles in double figures was sophomore De'Von Cooper, tallying 16 points (tying a career high) on a 5-of-9 (.556) clip. Sophomore James Baker notched 11 points, coming up just one point short of a career high. Junior Jordan Walker chipped in with 10 points, including a four-point play that reversed the momentum in favor of the home squad with 5:55 remaining in the contest. The Eagles finished the tilt connecting on 24-of-53 (.453) shots, 11-of-25 (.440) from long range, and 14-of-19 (.737) at the charity stripe. Morehead State returns to action on Saturday, as they take on UT Martin. Tip-off is set to commence at 6:35 p.m. ET at Johnson Arena.